FTAA: The Free Trade Agreement of the Americas: a collusion between governments and corporations with the intent to rewrite the laws of human and ecological rights for all countries that have signed onto the agreement. Corporate globalization concentrates more power and wealth into the hands of fewer people. This global economic system relies chiefly on the exploitation of people as cheap labor and plunder of the Earth's resources and life forms as fast as possible. This results in widespread poverty and ecological destruction, much harder to reverse than inflict. Global corporate expansion weakens nearly every sector of society; nonetheless, it has united a broad sector of people into a mass movement that can make radical change. The Free Trade Area of the Americas is the next phase in the globalization of corporate greed: greed with little or no limitations versus human need. The FTAA is an international trade agreement that will increase corporate power as it endangers the lives of millions of people, largely powerless peasants and worker peasants, who stand in the way of the corporate moneymaking schemes. Initiated in 1994 by the 34 countries of the Americas — except Cuba, the FTAA would create the world's largest free market zone affecting 900 million people and nine trillion USD of capital. The business sector in the FTAA countries has joined the government-led FTAA talks at every step; they discuss trade matters in a covert deal-making strategy with tight security. As an extension and expansion of NAFTA, the FTAA would deepen the negative effects of NAFTA, which we have seen throughout Mexico, Canada, and the U.S. since 1994. The FTAA would increase NAFTA’s damage to the other 31 countries that have signed onto it. 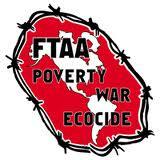 The dire results of NAFTA prove that the FTAA will impose only disastrous results for the exploited people of the Western hemisphere.